Mozambique – every day's a holiday! There are two separate holidays on September 25, celebrated in 4 hemispheres, that collectively mark the beginning and the end of colonialism. Vasco Nunez de Balboa was 26 in 1500. It was only 8 years after Columbus’s first voyage, and the young Spaniard sought adventure in the New World. Balboa joined the crew of an expedition headed west to Hispaniola (Cuba) and on to Colombia with the purpose of establishing a settlement. 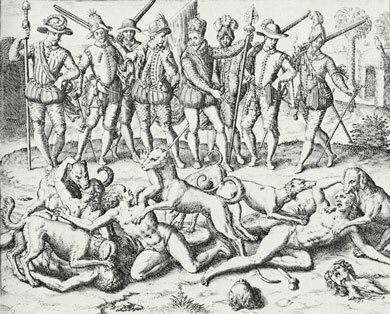 Due to lack of men, the Spanish were unable to maintain a colony in Colombia. Balboa returned to Hispaniola and pursued Plan B: pig farming. Evidently, Balboa was not a very good pig farmer. He went broke, and was even unable to join the next mission to Colombia because he owed so much money. The following year he didn’t ask. He snuck aboard a ship carrying supplies to the new settlement. When the ship arrived in South America the newbies found the Spanish colony deserted. Unable to defend the colony or to sustain their food supply, the Spanish settlers had hightailed it back home. Balboa, who had some familiarity with the land, recommended the group move west, where the indigenous tribes were more peaceful. Thus, the stowaway became the group’s unofficial leader. In 1513, Balboa heard rumors of a sea to the south, across what is now Panama. Balboa led a group of 90 men southwest across the isthmus. On September 25, 1513, Balboa scaled the highest summit and became the first European to set eyes upon the eastern half of the Pacific Ocean. Unable to fathom its vastness, he called it the “South Sea” because it appeared to follow Panama’s southern shore. It was downhill from there for Balboa, literally and figuratively. A few years later a new governor arrived in town, appointed by the King of Spain. To ensure Balboa would not usurp him, the governor accused Balboa of treason. Balboa and 4 of his men were tried and beheaded in 1519. From the Northern and Western Hemispheres we move half a world and four and a half centuries later to the coast of Africa. In the 1500s, Portugal owned half the world (’cause the Pope said so). By the 1960s, the former Iberian powerhouse was tightly clenching its few remaining colonies. Spurred on by success in Tanzania, FRELIMO, Mozambique’s anti-colonialist liberation party, formed (illegally) in 1962, and received support from China and the Soviet Union. On September 25, 1964, FRELIMO went militant, attacking a Portuguese base in Cabo Delgado. The fight for independence would be bloody and costly, lasting over a decade. Ultimately, Mozambique won independence, like other Portuguese colonies, because of a government coup in Portugal in 1974. Thus ending almost 500 years of Iberian colonialism in Africa and the Americas. In memory of that bloody first day, September 25 is Armed Forces Day in Mozambique.